Later this month, I will begin working as a genealogist for Ancestry.com in Ireland. This, of course, means that my American adventure is coming to an end. It's been a great 5+ years in New York City and Washington, DC. The buzz around genealogy, both as an industry for those who work in it and as a pastime for those who do family history research, has increased dramatically over that time. I'm still just a relative newcomer when compared to some of the pros who have been in this industry for decades, but the changes I've seen in the last five years alone have been phenomenal. The years ahead promise to be even better and I am really excited to begin working for the ProGenealogists group. What does this all mean for Townland of Origin? Well, I absolutely intend to try and continue highlighting records and resources that can help people with their Irish genealogy research in the U.S. and Canada. I have made connections with some great people over the last couple of years because of the website. It's been really great getting to know you all. I hope that some of you have learned about new records, organizations, and groups for your genealogy research. Last March, I did a radio interview with Dr. Miriam Nyhan at the Glucksman Ireland House at New York University. 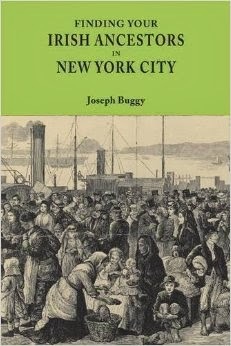 The focus was, of course, genealogy, and we discussed how I got into it, researching the Irish in New York City and the wider U.S., Irish research compared to other ethnicities, and research in Ireland. This page will bring you to an archive of their shows. The relevant show is March 14th and my interview runs from 30:30 mins - 48:20 mins. Labels: Expert, Genealogy TV, Immigration, New York, New York City, U.S.A.